Panelist Mike Raia ’05, left, makes a point during the Veritas and Values program. Listening are, from left, panelists Luanne Santelises ’06, Andrew Rodgers ’07, and Andrea Rojas ’17. When U.S. President Donald Trump called for an end to the Deferred Action for Childhood Arrivals program, or DACA, Providence College student Monet Eugene ’20 (Dorchester, Mass.) said she was in complete shock. While Eugene has experienced firsthand the long road to legal immigration in the U.S., some of her Providence College classmates said they were unaware of the fear and potential consequences their peers will face if Congress does not enact immigration reform by March 5, 2018. Some of the nearly 800,000 “Dreamers” protected by DACA will lose their legal status, leaving them unable to work, drive, or remain in the country legally while facing possible deportation. Those issues were the topic of an interactive Veritas and Values presentation, “DACA Deconstructed: Alumni Perspectives through Their Everyday Work.” Held at the newly renovated The Center for Moore Hall, the program was sponsored by the PC National Alumni Association and hosted by the Student Alumni Association. The panel focused on how the careers of the participating alumni are affected by DACA and the PC experiences that influenced their current career path. 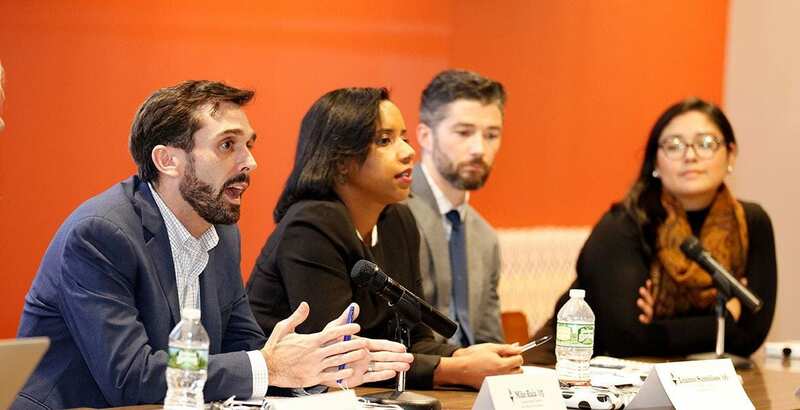 The panelists included Mike Raia ’05, communications director for the Office of the Rhode Island Governor; Andrew Rodgers ’07, associate attorney at Green & Spiegel, an immigration law firm in Providence; Andrea Rojas ’17, citizenship and immigration caseworker at Dorcas International of Rhode Island; and Luanne Santelises ’06, attorney and founder of Santelises Law Firm in Providence, which focuses on all areas of immigration law and procedure. Sarah Trayers ’17, a graduate assistant at PC who co-founded the Providence Immigrant Rights Coalition and served as its president, was moderator. DACA was established by former President Barack Obama in 2012 to allow some immigrants who entered the U.S. as children to receive deferred action from deportation for two years. Since President Trump announced plans to end the program, Congress is charged with creating immigration reform policy before the March deadline. Panelist Andrea Rojas ’17 listens to an audience member. Students were urged by forum panelists to support those affected by DACA. According to Santelises, who helps clients navigate the complex immigration process, many fear deportation. She urged the approximately 100 students in the audience to become activists. “Call your congressman, write to your congressman, be vocal. Get out there and let your congressman know you want this to stay. These young individuals deserve legal status,” said Santelises. Rodgers, whose practice is focused on representing small businesses, startups, and investors, said he is receiving more calls from individuals about DACA, which means he needs to watch immigration policy very closely. Raia called for immediate immigration reform. 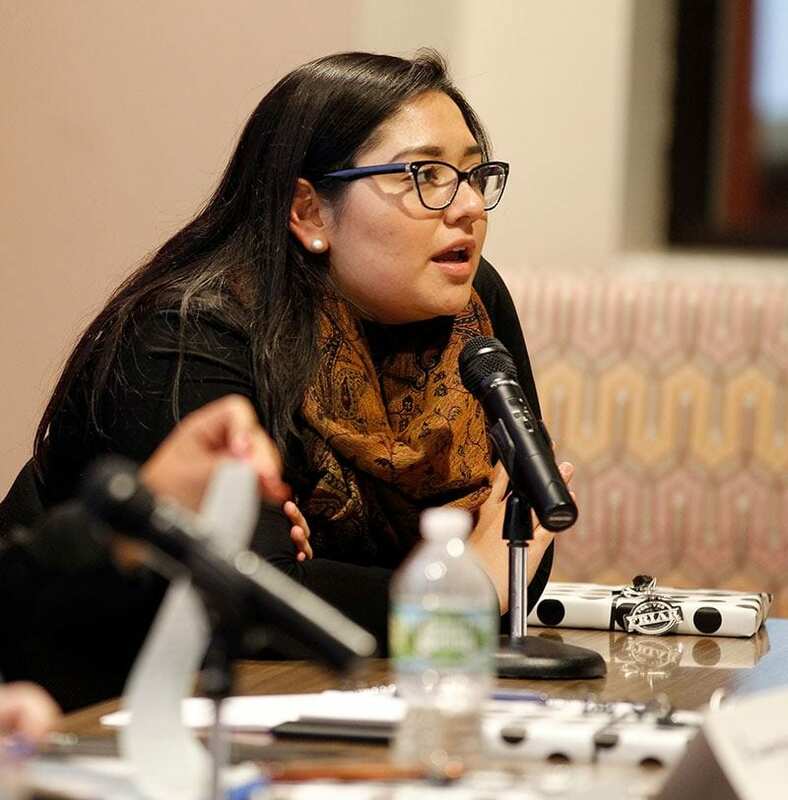 When panelists were asked how to help, Rojas said that when Rhode Island made in-state tuition available for undocumented immigrants “it was a huge win.” She called for more services for students during and after their college years. 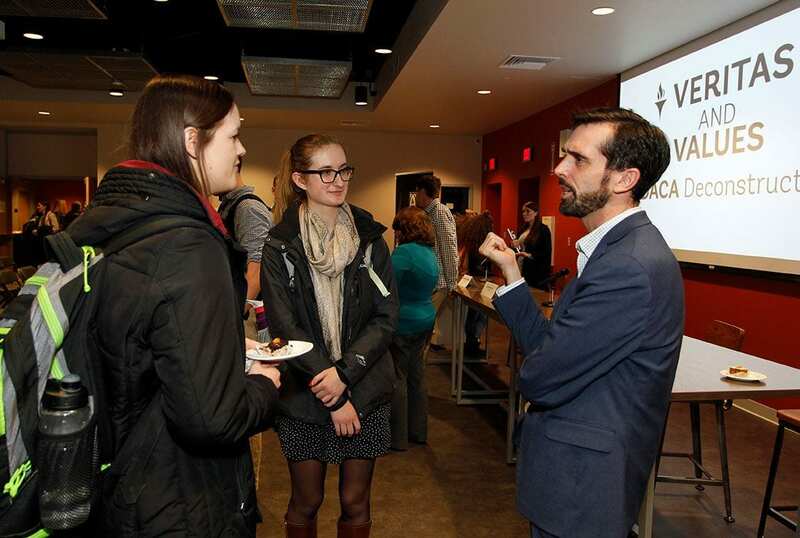 Panelist Mike Raia ’05 speaks with Rachel Laravie ’18, left, and Amy Gilligan ’18 after the program. Raia spoke of the Rhode Island Promise Program, which provides free tuition for Rhode Island residents at the Community College of Rhode Island. “It makes the difference between an upwardly mobile job and earning minimum wage,” he said. When asked how PC shaped their career paths, the panelists said their studies and the people they met formed who they are today. For Rojas, it was her majors in global studies and sociology and the conversations she had in class that stuck with her. Santelises always knew she wanted to be an advocate and help others. Veritas and Values, launched in 2015, offers programming that facilitates interaction between alumni and students.